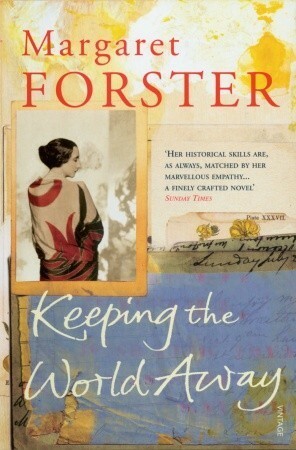 I expect a book by Margaret Forster to be good and this one is no exception. It is essentially the story of a painting, a variant of Gwen John’s The Corner of the Artist’s Room in Paris, as over the years it passes from one woman to another. Her room was the image of how Rodin wished her to be and she painted a sunlit corner of it where it was “all peace and calm and serenity” in contrast to Gwen herself who “radiated energy”. She rearranged the room and painted several versions; with the window open, with an open book on the table, with flowers on the table, with and without the parasol. I wished that the whole book had been about Gwen John. However, it’s about the painting and how its successive owners acquire it and what it means to each of them. It gets lost, is stolen, turns up on a market stall, is bought, given away and fought over. As each new owner is introduced there are links between them, but each time the painting passed to a new person I wanted to know more about each of them. I can’t quite agree with Gillian. I can see that seeing a painting in isolation from the artist can be a pure experience, but I’m always filled with curiosity both about artists and authors – who they were, when they lived, what was going on in the world they lived in and how it affected their work. However, I also think that a painting is like a book in that they can both be interpreted in many ways regardless of the artist’s or author’s intentions. This is a remarkable book, which I’m sure I shall read again and again. I enjoyed this post very much, Margaret. I do love novels that feature works of art almost as if they are another character. You do a lovely job of letting us in on the feel of this book without giving it away. The Rodin connection makes it especially enticing for me. A must read for sure. Thanks! Thanks, TJ. I now need to find out more about Rodin. I’ve got this book and am looking forward to reading it. I read Diary of an Ordinary Woman earlier this year, but I was sort of disappointed by it (still a good read, but I think my expectations were too high, and I had a hard time with some the decisions the main character made–or didn’t make), so I think I put off reading this one after. Now I will have to move it back up the pile, however! I love that painting by the way. Danielle, I have mixed feelings about Diary of an Ordinary Woman. I didn’t read anything about it before I read it – not the back cover or even the small words “A Novel” on the front cover, so I was disappointed when I realised it was fictional. That taught me to read titles more carefully. I think Keeping the World Away is better but as I said in the post I would have preferred it to be more about Gwen John, or at least not about so many different women – I just kept wanting more about each one – which is not a bad thing.